Chilli Awarded Family-Friendly Employer ⋆ Chilli Marketing Ltd.
From the day Chilli Marketing was founded, we have a primary mission in mind: To provide the best of our services to clients and let clients be happy working with us. This philosophy doesn’t apply only to clients, but also our colleagues too. For years we maintain a relatively small but cozy working environment, servicing a pool of stable and satisfied clients. It aims to keep up our quality of services as always and more importantly, it helps strive for a work-life balance for our people. Having these in mind and in actions, Chilli is glad to be nominated and granted the Family-Friendly Employer Award this year. 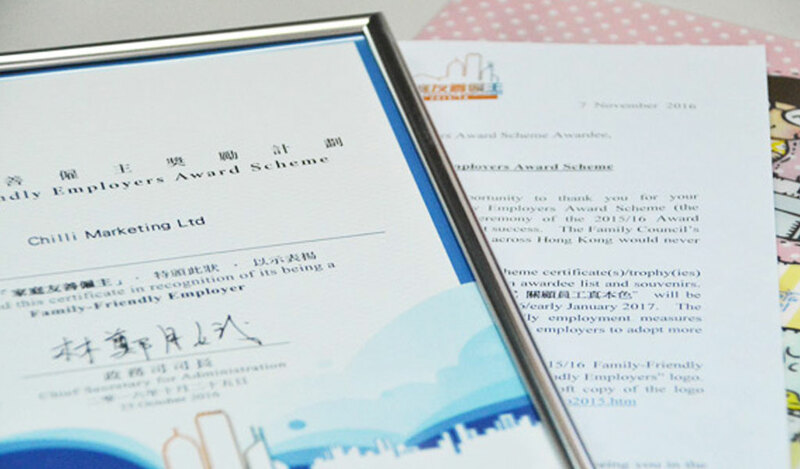 We would like to thank our business partner who nominated us, the Family Council from Hong Kong Government who granted us the award and our colleagues who dedicated their time and efforts to create and maintain this effective and harmonious workplace.